Sketch shewing the Route of the recent Arctic Land Expedition. 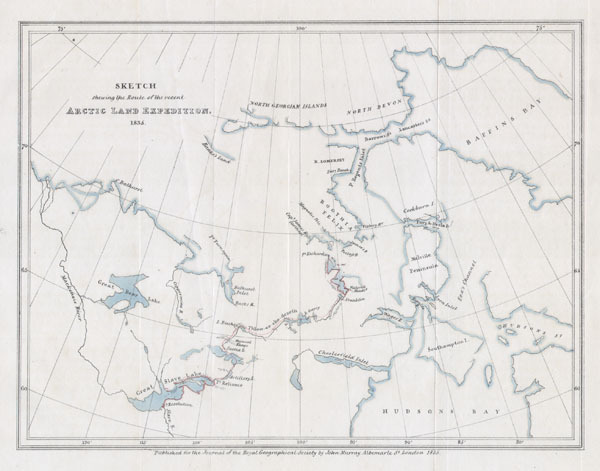 This hard to find map, dating to 1835, was drawn by the Royal Geographical Society cartographer John Murray to illustrated the journal of the Arctic Land Expedition. Depicts the parts of Canada north of Hudson Bay to Baffin Bay in the northeast and Great Bear Lake in the west. Region depicted is only partially correct and is indicative of the early period of Arctic exploration.